When the East New York savings bank on the corner of Pennsylvania and Atlantic avenues was demolished last year, longtime East New York resident Zulmilena Then was devastated. Then, 29, an architect, feared rezoning under Mayor Bill de Blasio’s affordable housing plan could threaten other buildings in the Brooklyn neighborhood. She decided to fight to bring the overlooked gems of East New York to the attention of the Landmarks Preservation Commission. “I thought that if no one else was doing it, I could do it,” said Then. Zulmilena Then, the founder of Preserving East New York, shows her preservation plan to a group who attended a Jane Jacobs walk. She started Preserving East New York to identify buildings that might be worthy of landmark status. At the moment, the area only has three landmarks— the New Lots Reformed Church and Cemetery and Public School 65K and Public School 108, both in Cypress Hills, along with four locations on the National Register of Historical Places, including the former 75th Precinct stationhouse and Substation #401, an historic subway substation. But Then believes there are more than 40 potential landmarks in the area, including Thomas Jefferson High School and the former Empire State Dairy factory on Atlantic Avenue – now placed on the Landmarks Preservation Commission agenda for July. The factory wall has a large tile mural of farms, fields and a man with a cow. Susan Tunick, president of Friends of Terra Cotta, said it’s one of the few tile murals left from the early 1900s. Efforts to get it landmarked began in 1999, but only took off when rezoning came to East New York, she said. Landmarks, potential landmarks and current national historic sites in East New York. Then’s appreciation of her neighborhood’s architecture is also shared by the Historic Districts Council, which recently named East New York one of its “Six to Celebrate” areas. Simeon Bankoff, the executive director of the council, said long-ignored neighborhoods like East New York are just beginning to get the respect they deserve. 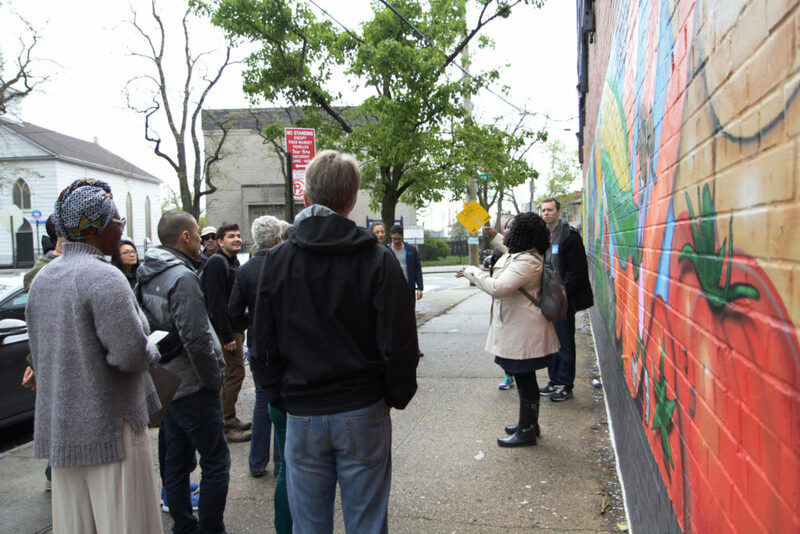 Farrah Lafontant, a longtime East New York resident, led a Jane Jacobs walk around East New York on May 8 and taught visitors about the area’s history, art, and historic locations. “During the first 20 years of the landmarks law or so, the commission was going for the hits, the obvious high-style architectural areas that are like ‘Yeah, this is an obvious historic district, this is full of the houses of the wealthy made with high quality materials’…that’s Manhattan pretty much,” he said. Other boroughs, he said, did not get attention. “There were major people in government in the 1970s who were talking very seriously about the downsizing of New York,” he said. Andrew Dolkart, a professor at Columbia University, said East New York’s social issues have taken priority over landmarking in the past, but he is hopeful that the neighborhood’s time has come. Then is one of those people, and earlier this year she began to attract volunteers. Farrah Lafontant, an East New York resident, said she “stalked” several buildings in the area, including row houses near the border of East New York and Cypress Hills. “They just spoke to me, I saw that they were architectural gems, I knew that they needed to be saved or recognized,” she said. “And after the East New York Savings Bank was demolished, I feared that other homes would have a similar fate.” She didn’t know how to move forward with her concerns until she met Then, and despite her concerns that preservation could bring gentrification, volunteered to help. Gentrification is inevitable, said Catherine Green, the director of Arts East New York. She worries about it but wants more residents to learn about the neighborhood’s history all the same. “I think it’s very important for us to keep the structure of the community and its buildings that keeps the character in this neighborhood together before developers change the entire landscape,” she said. Matthew X. Kiernan, who specializes in photographing city neighborhoods, started taking pictures of East New York in 2013. “The neighborhood has always been working class, and the many institutional structures, former synagogues, churches, banks, not to mention the variety of housing constructed in the late 19th and 20th century, speak to the hopes and dreams of those living here, not only then but now,” he wrote in an email. Kiernan said the neighborhood’s treasures are hidden in plain sight.